As detailed elsewhere, the signal box is on land owned by Network Rail and has trains running past. NR's safety management rules applied, and unrestricted access was not possible without some sort of tenure. Indeed for many years, no access at all by CPRR members was possible (see earlier history pages). 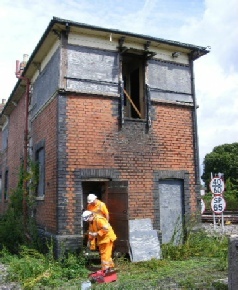 After the events of mid 2011 Network Rail arranged some occasional supervised access to the box. In Spring 2012, they were able to provide some fencing which did help, but the need for supervision and access permits each time still meant any access was very limited. Listed and photographed some of the other defects. Unfortunately the water main was severed during the laying of a new fast track through the station, making cleaning up after the pigeons difficult! So we installed a temporary rainwater harvesting tank to partially overcome this setback, just before all work ground to a halt once more. It was to be October 2013 when we were next able to restart, having found another interim solution to the access problems. Network Rail had provided a fenced safe walking route for us, and granted permission for us to resume the work. This was an excellent advance, and we have had teams in the box pretty well every weekend since November. During our absence the world had moved on around us. The recent increase in speeds and use of loco-hauled stock on the Chiltern line had increased the noise and vibration felt inside the box, worsening the cracks in the brickwork. 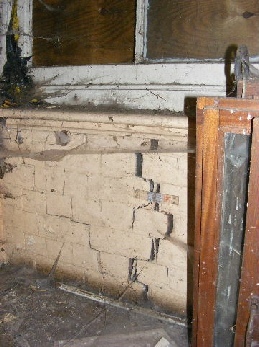 Roof slates had departed, and there were now several leaks and patches of wet cladding underneath. 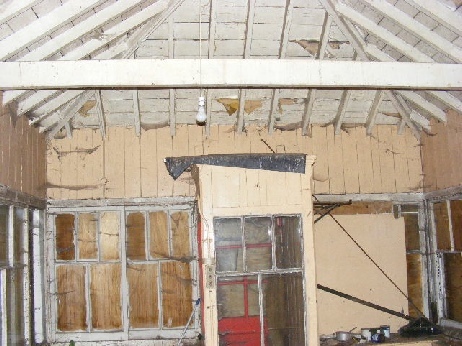 Serious rot was discovered in some supporting timbers. On the good side, our 2011/12 works had succeeded in excluding birds and securing the box. So much work was to be done, and we started seriously in November 2013. The story of the works since then is another page!